Luxury Home tranquil surrounded by tropical foliage and lava rock wall. Beautiful tiled pool with waterfall and hot tub. Experience of a serene mini resort not a party house. There is not a safety fence around the pool so use your discretion when booking with small children. Very spacious single level home with high ceilings. U shaped around pool as a courtyard. 3 bedrooms offer enough beds to sleep 7. The master bedroom is very large. There are one king and a futon sofa/bed. The second bedroom has a queen bed and one twin. The third bedroom has a queen bed and an air mattress which is easy to move around. All bedrooms have a tv as well as the family room. All new bedding and pillows. 2.5 large luxury bathrooms with marble and travertine. Soaking tube, separate shower and two sinks in each full bathroom. Spacious as living room as you enter the home with large window of the pool and back yard. Flows into dining area, luxury kitchen and family room with 10-14 foot ceilings. Beautiful covered lanai with built in Viking BBQ and mini fridge. High end kitchen with granite counter tops, gas stove, double oven, two microwaves, dishwasher and Sub-Zero refrigerator. Less than 3 minute drive to two beautiful beach parks. Shopping center is 4 blocks away. Foodland Farms grocery store, Starbucks, La Tour Restaurant, Pieology Pizza, Honolulu Fitness Center, Yoga studio, hair and nail salon and more. Very conveniently located 10-15 minutes from Hana’uma Bay for world class snorkeling. 10-15 minutes from Waikiki and Ala Moana Shopping Center for world class shopping. Beautiful hike in the back of the valley and around Aina Haina. There is ample parking in front of the house. Basic rental agreement to be included. Owner apartment with two small elderly dogs. Has separate entrance and does not access house or pool. I designed and lived in this home since 2003. I am a widow of a 21 year veteran. I designed the home and have art from around the world including antiques. It's in one of nicest areas of Honolulu. Master Bathroom has a large soaking tub. Large separate shower. all marble and travertine. Double sinks with drawers, cabinets and linen closet. One minute drive to beautiful Kawaikui beach park. Breath- taking views of Koko Head. Fun for adults and kids. 5 minute drive Famous Kahala beach and Kahala Resort Hotel where Presidents have stayed. New central AC air in bedrooms. There is a dehumidifier and ceiling fans In the rest of the house. Hawaii also has trade-winds most days which keeps the temperature comfortable. Regular coffee maker and French press. Staff, private chef, chauffeur, massage all available with appointments. Owner can give you information about anything on the island. This house was conveniently located just outside the city. We enjoyed the more laid back atmosphere it provided. If you are looking for a party house, this is not the property for you. It is beautifuly furnished with a lot of love and attention to detail. Owner lives in a suit attached to the house, but other then the initial welcome and tour, did not bother us once. Big beautiful house with an amazing pool area, would not necessarily recommend for small children as pool has no safety fence. Cynthia provided us with information about the area we found helpful. Thank you for sharing your beautiful home with our family we made many memories. Thank you for your thoughtful review. I agree that the house may not be the best choice for small children because of the pool. I added that to my description. Thanks for your feedback and for taking such good care of the house. This beautiful home was perfect in every way. Close enough to Waikiki to go out for fun yet far enough away to relax and do yoga. The kitchen is a chefs dream. I highly recommend this home. Very high end custom home in a nice neighborhood. 10' ceilings and 7' doors. All the bells and whistles. Beautifully furnished and stocked with everything necessary for a long stay, even a piano! They left us with lotions, soaps, snacks, etc. Definitely the nicest rental I have stayed in. The hot tub and pool were amazing. We had a problem getting the hot tub going when we arrived, but the owner was very responsive and had the pool guy out the next day to take care of it. Location is close to a grocery store and Longs Drugs with plenty of dining choices just 1/4 mile away. Located about 10 minutes from the resorts, which is perfect because you are away from the madness. Nice beach just down the street and 12 minutes from snorkeling at Hanauma Bay. Its managed by the owner, so the service is much better than what I've gotten from rental agencies. Highly recommend this home! Our visit to Honolulu was wonderful and staying at this home made it our best vacation ever. We (two couples and two teenaged boys) were greeted on arrival by a wonderful caretaker, Laura. Laura kept in touch with us throughout our stay and responded to any questions we had, which were few. The house was immaculate, beautifully decorated, spacious and had every amenity any family would need. The house is within walking distance of grocery and other stores. The neighborhood is upscale and safe. We had no concerns allowing our son, a distance runner to take early morning runs. The home is luxurious, and we would rent again on our next visit. Thanks so much and Weiss happy you enjoyed your stay. It was a pleasure having you and you family. Fantastic, exceptionally clean with amenities beyond normal expectations. Our family spent Christmas here and everyone felt the Christmas spirit with a real sense of a Hawaiian life style. 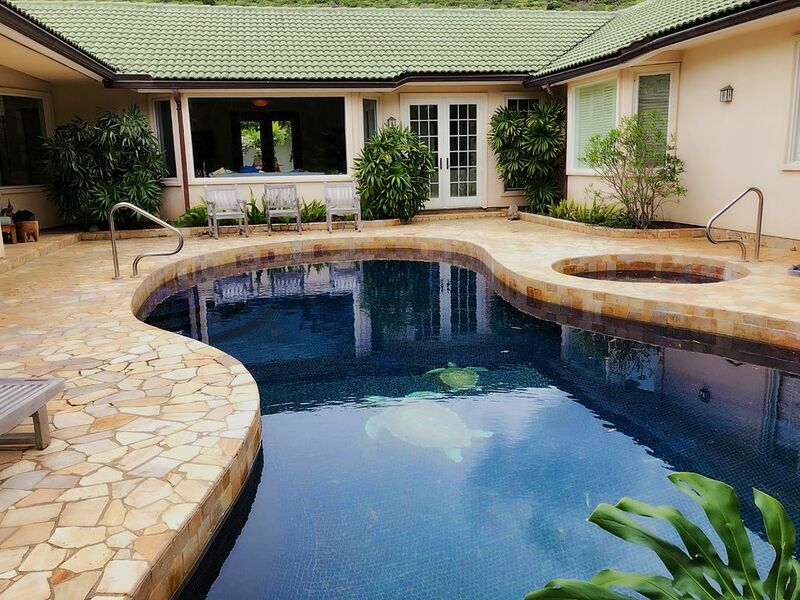 The property was located conveniently close to all stores, the city of Honolulu but in a neighborhood environment allowing for privacy and relaxation. We can not say enough about how much we enjoyed this location. Luxury and Style in a Perfect Location! This is an exceptional property with qualities rarely matched. Superbly located within walking distance of quality shopping, restaurants and other amenities, this villa still maintains a tranquil and quiet ambiance with beautifully maintained pool, spa and gardens seemingly a world away from the busy tourist areas, even though they are easily accessible only a few minutes down the road. Every possible convenience is provided for a luxury stay, with nothing overlooked by Cynthia who is a very charming and thoughtful hostess. Comfortable beds, impeccable cleanliness and an abundance of space in every room contributed to an unforgettable visit for us. The house is wonderfully designed to maximise light and the outlook onto the magnificent pool in the internal courtyard. This is a property which will delight even the most demanding and fastidious guests - we are unable to recommend it highly enough. So much so that we are looking forward to finding the opportunity for another trip to Hawaii and to availing ourselves of Cynthia's hospitality once again before too long! In beautiful Aina Haina with spectacular mountain views. HANA'UMA BAY NATURE PRESERVE for spectacular snorkeling (10 minute drive). MAKAP'UU LIGHTHOUSE easy hike and the views are breathtaking (20 minute drive). WAIMANALO BEACH, the most Beautiful beach on the island, it's two miles long with spectacular views of the Olomana Mountain range and torquise ocean. Great for beginner's body surfing. Not crowded or frequented by tourists. HO'OMALUHIA BOTANICAL PARK: 35 minute drive. Walking or driving through lush 400 acres in windward Oʻahu this park features plantings from major tropical regions around the world. from the Philippines, Malaysia, Tropical America, India & Sri Lanka, Melanesia, Hawaii, Polynesia, and Africa. spectacular views. Limited parking so go early and ID needed as both are behind gated neighborhoods. PALI LOOKOUT with panoramic views of windward side, 20 minute drive. FAVORITE RESTAURANTS nearby: casual; La Tour Bakery (one minute drive). Lots more casual restaurants in Kaimuki (10 minute drive). More upscale: Roy's in Hawaii Kai (10 minute drive) Le Bistro (5 minute drive) The Veranda at Kahala Resort on the beach (10 minute drive). Morimoto's (the Iron Chef) in Waikiki (15 minute drive). Water activities in Hawaii Kai: parasailing, jet skying, kayaking, snorkeling (10 minute drive). In Waikiki: sunset dinner sailing, snorkel sails, surfing and swimming 15 minute drive. SHOPPING is 1 minute drive or 5 minute walk with Foodland Farms (grocery store), Starbucks, La Tour Restaurant, Pieology Pizza, Honolulu fitness center (gym), Yoga studio, hair and nail salons. Very conveniently located 10-15 minutes from Hana'uma Bay for world class snorkeling. KAHALA MALL 10 minute drive. ALA MOANA SHOPPING CENTER 15 minute drive.